Benjamin Bursley. Farmer. Real estate valued at $600. Personal estate value $100. Cool. One small problem. When first reviewing the info contained on the 1860 Federal Census for Monticello, Wright County, Minnesota, it didn’t really mean anything to me. I had no idea how Benjamin’s estate compared to 2014 income standards, nor how his family fared compared to those living around him. Was he rich? Was he poor? Somewhere in between? I wanted to know what life was like for his 12 year old daughter, Lavina, and placing her family in context with the era in which she lived was important to answer my questions. 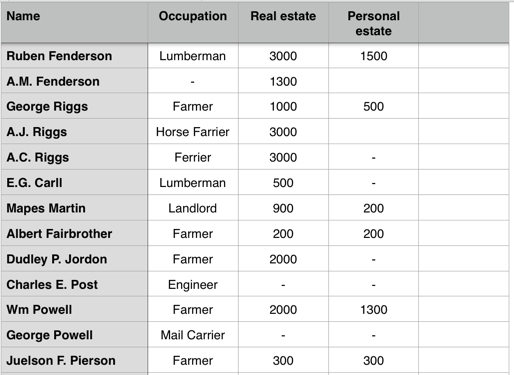 Census data transcribed into a spreadsheet to compare financial details of other citizens of the town. Thankfully, it was a relatively small town with only 19 pages of census data, and of those, only a few adults (mostly males) with real estate per page. Transferring this info helped to truly analyze and appreciate the neighbors of my subject, Benjamin Bursley, and painted a clear picture of the types of services the town had available. Not surprising, most were farmers, but the town also had farriers, clergymen, carpenters, coopers, and others too. Martin Fox, a merchant, had the second highest real estate and personal estate listed, at $3,000 and $3,500 respectively. The town’s wealthiest citizen was farmer Zadoe Brown, with real estate valued at $5,000, and a personal estate of $3,000. The neat part about using a spreadsheet is it can do the math for you. Numbers told me that the average reported real estate in Monticello in 1860 was $1,356, with the average personal estate at $405. Rats. Things were pretty darn tough for young Lavina, my great-great grandmother. Looking beyond the single page of census data really helped to paint a clearer picture of what challenges she faced growing up in 1860. And made me appreciate her even more. This entry was posted on Tuesday, January 21st, 2014 at 9:45 PM	and posted in Uncategorized. You can follow any responses to this entry through the RSS 2.0 feed. « Getting the ROI on your genealogy subscriptions?? As a bit of comparison, using the figures mentioned in “measuringworth.com” (http://www.measuringworth.com/datasets/uswage/), an unskilled laborer working around 60 hours a week could expect to take home $250 a year (at $0.08 an hour). The manufacturing wage was a bit higher, but using a figure supplied by the BLS of manufacturing wages in 1930 and using the index supplied on Measuringworth, they could expect to take home around $400 a year assuming a 60 hour work week in 1860. These are all back of the envelope type calculations. My guess is that he was doing better than many at the national level given that he had assets equaling several years of unskilled laborers income, but that his fellow townsfolk were largely better off than he was. However, given the likely high rate of inflation that went on during the Civil War, I wouldn’t be surprised if Benjamin faced difficulties at procuring basic goods that would have obtainable at his status in 1860. Value of Personal Estate.– Under heading 9, insert (in dollars) the value of personal property or estate. Here you are to include the value of all the property, possessions, or wealth of each individual which is not embraced in the column previous, consist of what it may; the value of bonds, mortgages, notes, slaves, live stock, plate, jewels, or furniture; in fine, the value of whatever constitutes the personal wealth of individuals. Exact accuracy may not be arrived at, but all persons should be encouraged to give a near and prompt estimate for your information. Should any respondent manifest hesitation or unwillingness to make a free reply on this or any other subject, you will direct attention to Nos. 6 and 13 of your general instructions and the 15th section of the law. Given that info, it would have been his carpentry and farming tools, livestock, and other personal belongings comprising $100 – which is an awfully small amount of household goods for a family of seven. Interested in your thoughts observations on that as well! I used the 60 hour figure as a general comparison of my stereotypical laborer of the period, working 6 10-hour days a week. Basing on that I would expect Benjamin to be earning more of that as a farmer/carpenter, otherwise I would imagine that he would change professions. I had misread the earlier figure of his personal estate. At $100, you are quite correct that figure sounds very low, a value that is only half a year of an unskilled laborers wage. Am I correct in that he was living on the 39.2 acres he purchased in 1857? From what I gather from the original survey images, he was right on the Mississippi River and much of the surrounding area appears to have been fairly swampy. Perhaps that took longer to cultivate and affected his earnings as well as any possible locusts. As the Census documents want the family to list personal property OWNED, could it be the case that his personal property was put as collateral for a loan to cover the costs of crop failures? He was either living on that lot, or on the nearby 120 acres that was transferred to him via a warrant. It was less than a mile away from his 39-acre lot adjacent to the river. Here are the two sites in google maps: http://tinyurl.com/jwtemrt.